Assassin's Creed Odyssey has a lot of innovative systems and mechanics to confuse inexperienced and veteran players. The huge open world is wide enough that will offer hours of exploration and fights but first, you need to learn some quick tips and facts to start your adventure. To help you avoid any problems that might present, read this review to get the basics of the game. The overwhelming icons in Odyssey are heavily reduced and you can even choose which ones to show, in the prologue you will have the option to decide which mode you wish to play. The Guided Mode is as usual in the majority of Assassin's Creed games, but the Exploration Mode in the other hand eliminates most icons with just the basics and the impressive map of Odyssey. In quest's dialogues you will have the option to ask for directions and locations of people or certain items that are required. Even though it seems hard, you always have your loyal friend Ikaros to give you a helping hand with his majestic little eyes. Both weapons and armors are very important for your character and it's own development, as you level up most of your gear will be obsolete but you can always go and upgrade them to your current level and even engrave them with special bonus and/or powers. There are several types of weapons: Swords, Staffs, Spears, Axes, and Daggers. All of them with different types to approach combat and bonus. Also, there are several types of rarity just as in Origins. It's important to note that Odyssey is fully customizable and personalizable, you can choose to match your clothes or to go full beast with the best gear you have at your hands. Remember that when you collect a set of armor that is legendary, all of the set will upgrade to the level of the last piece you collected automatically. 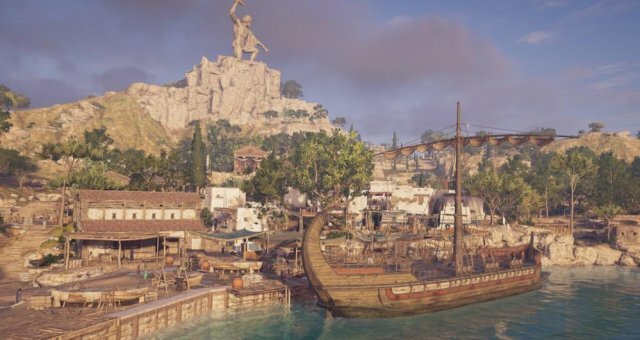 Mercenaries in Assassin's Creed Odyssey are like the phylakes in Origins, but with some major changes. For example, now mercenaries will hunt you down if you commit crimes, like killing civilians, tammed animals, stealing and others. Sometimes these mercenaries will out-level you so it's better to pay the fee so they stop following you. I find mercenaries sometimes annoying because in some missions where im trying to go stealthy a mercenary that is 5 levels ahead of me enters the compound or house and starts to chase me. Even though you don't have to pay all the bounties sometimes is a life-saving. There are several special abilities that you can unlock in the skill tree, these abilities use the adrenaline you gain when performing kills, attacks parries and more, similar to the rush attack in origins when you completed the adrenaline bar, the twist here is that you can select up to 4 different abilities depending on your approach to the fights, there are passive abilities like regenerating life or more offensive ones like the famous Sparta Kick, there is a cooldown after we use one ability but in the meantime we can use one of our other three abilities. Switching between abilities and learning to manage smartly our adrenaline bar can lead to an easier battle. In Assassin's Creed Origins we had our animal companion Senu, now in Odyssey, we also have our flying friend: Ikaros. Ikaros plays the same role as it's predecessor, help us to scout and spot enemies as well as objectives, forts, cities, you name it. We can upgrade Ikaros's vision by synchronizing our character in the specific points around the map. These synchronizing points are also important because they can serve as a fast-travel point later so we don't have to be traveling miles with our slow boat and being hunted by pirates.